Why Nonprofits Employees Quit #Infographic - Your journey to a new career. Are you thinking of a career in the nonprofit sector? Do you manage a Nonprofit organisation? Find out why NGO employees quit! All small and medium sized businesses know how difficult it is to keep good employees. The challenges are multiplied for the nonprofit. The Infographic shows what causes best employees to leave and what can be done to improve NGO management style to retain those employees. Find out if there is an opportunity to develop recognition programs, mentoring or expand training. Do you communicate and provide feedback for your associates? What opportunities are there for advancement or career development in your organisation? Have you compared any of your Human Resource practices with for-profit companies? Are there opportunities to change scheduling and workflow? Are your associates engaged in the mission? If you are a NGO manager, do not take current staff for granted. We all know the costs in time, resources, office morale and production when we need to replace a valuable employee. 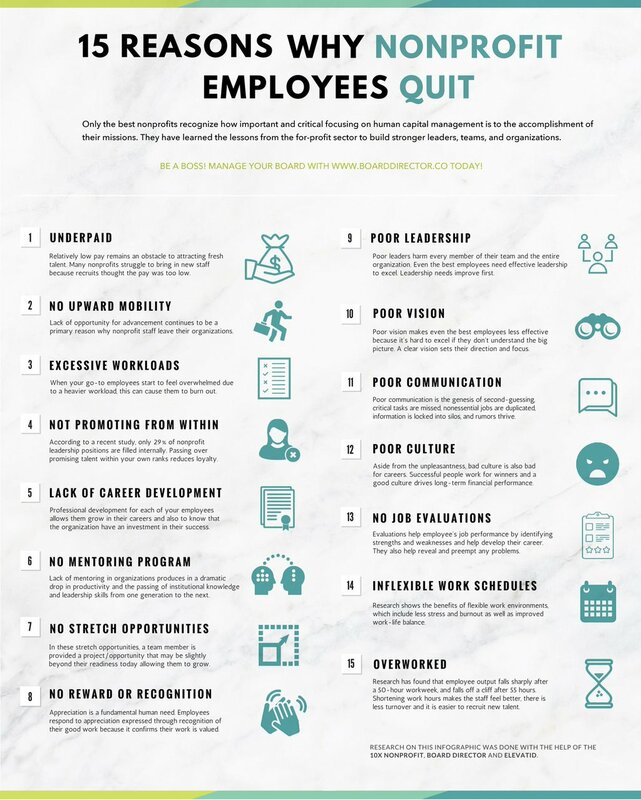 Take a look at each of these fifteen reasons why nonprofit employees quit and commit to identifying and providing solutions to change. Improve your workplace environment and become an organisation that is not distracted by employee turnover. Now is the time to find out Fifteen Reasons Why Nonprofit Employees Quit. With this information you can build a better organisation and keep your best employees.